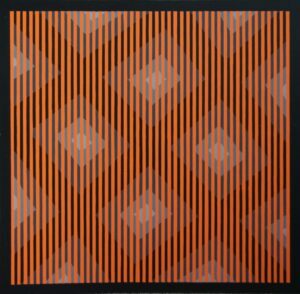 Leslie, to Pete: What lessons about the purpose and intention of art do you draw from your practical and historical knowledge of ‘Op Art’, please? Pete: To my way of thinking, in the past art may have been a way of keeping a record of things but nowadays art is purely aesthetic – to provoke a reaction of some kind. Whether these are positive or negative reactions doesn’t make any real difference to my art (although I would be lying if I said I didn’t draw pleasure from people telling me they liked it, and feel a little disappointed if people tell me the opposite). I remember the first time I participated in an exhibition – I had three paintings on display. It seemed that all the other paintings were ‘chocolate-boxy’, i.e. the dreaded landscapes, portraits and still lifes. Walking around seeing people looking at the paintings, and overhearing their comments was a real eye-opener – the landscapes, portraits and still lifes elicited comments like ‘That’s nice’ or ‘I like that’ and then they’d get to my paintings and full-blown arguments would develop about whether it was art, whether anyone could have done them as well as whether they liked them or not! So, in my view, art should be aesthetic and hopefully discussion provoking! Leslie, to Jean: You say your pots are, ‘inspired by classical forms which were used for ornamental, functional and ritual purposes’. Can you tell me the story behind how this subject choice came about, please? Jean: Many years ago, a good friend of mine spent some time in Greece, cooking on a yacht in the Mediterranean. At the time she returned to the U.K. bringing some of the local clay dishes which were just the kind I wished for cooking and serving the food I was planning to make for my clients. It occurred to me that it might be possible to make something similar myself. 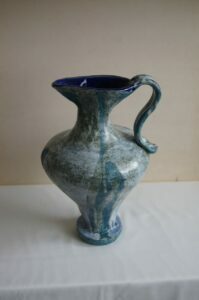 So I enrolled in a ceramics class – this led to my studying and drawing inspiration from ancient clay pots and vases in museums, both here and in Europe when on holiday! Leslie, to Pete: Can you explain, please, how you achieve ‘an optical illusion of movement or… a feeling of tension on the surface of the painting’? 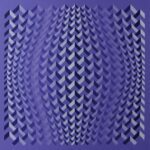 Blue-violet convex chevrons, by Pete Greening. The reversal of the underlying grids makes this appear to bulge out. Dimensions: 24 inches square. Pete: So, you want me to give my secrets away…? Actually it’s quite simple, to me anyhow. Things nearer the observer look bigger than things further away, and distance also lightens hues so the smaller and lighter-coloured a shape is, the further away it appears to be. Using progressively wider lines in a painting, with the wider lines being darker hued, can make the surface appear to bulge out towards, or recede from the viewer. This can also create the illusion of movement. By reversing this natural effect, and making smaller areas darker than larger areas, the eye sees something small so the brain thinks it should be far away, but a darker hue makes it appear nearer. 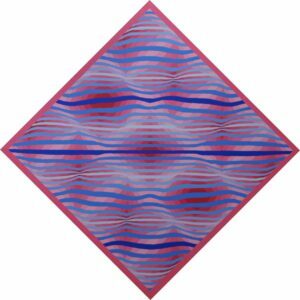 This destroys the illusion of movement, and thus creates a feeling of tension on the surface of the painting. Black Rainbow – Orange, by Pete Greening. The orange becomes more intense as the background becomes darker. 24 inches square. Colour relationships also change – if you have a solid bar of, say, red and put it alongside stepped tints of another colour the red will look different when next to a paler version of the other colour than it does next to a strong version of that colour. Leslie, to Jean: Can you describe the technique behind your art – particularly what you mean by ‘coil built’ pots, please? 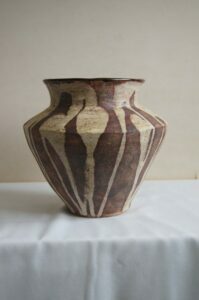 Jean: There are many methods of hand-building pots with clay, and the one I found which suited me best and most usually use is one of the earliest practised by human kind – building up forms by making coils and joining them together. When the pots are fully dried they can be fired, then glazed and fired again at an even higher temperature. Leslie, to Pete: What is the story behind your desire to, ‘explore the optical effects of linear distortion and arithmetical progression’? 2) I like my paintings to confuse and bedazzle the viewer (although this is difficult now as I seem to be immune to the effects). Most of my paintings rely on what I call ‘wonky grids’ where lines aren’t quite parallel / vertical / horizontal but become arithmetically more or less so as they progress across, up or down the image. 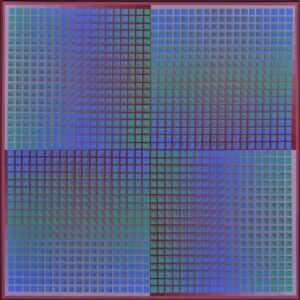 The exploration bit comes in because I often work in series where the initial painting gives rise to variations on the same theme – some are just direct reversals of the underlying grids, i.e. instead of small shapes getting larger into the middle they are large shapes getting smaller. Others look like completely different paintings but are based on exactly the same underlying grids. Leslie, to Jean: Which creative artists have inspired you? 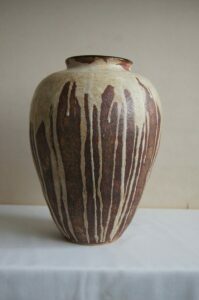 Jean: Many 19th and 20th century craft potters have kept traditions alive and developed new ceramic forms – potters such as Bernard Leach, Hans Coper, Mick Casson, but for me, pots from much earlier times offer the most inspiration. Leslie, to Pete: Some of your images have been used for limited edition vinyl LPs – how does your art and the type of music you’re interested in dovetail/work together? Pete: In 1970 I had a musical epiphany. Most of my friends were into prog rock – Yes, Led Zeppelin, Genesis and other similar bands. While I quite liked some of it, I couldn’t see what it was about it that made my friends so … fanatical about it. On holiday in Holland I went into a record shop and was immediately struck by the music that was being played over the shop’s sound system – I enquired what it was, and found it was Kraftwerk’s first LP. That started me of on a lifetime of liking the music that acquired the genre name ‘Krautrock’ – Tangerine Dream, Cluster, Amon Dűűl II, and Neu! to name a few bands, as well as all sorts of other electronic and ‘weird’ music, including the American minimalists Terry Riley, Philip Glass and Steve Reich. Following on from this I discovered many other electronic music composers and bands, mostly instrumental or using voices as instruments rather than for singing vocals, and also mostly long form music – I have many LPs with sidelong tracks, and CDs with tracks over an hour long. I find I can immerse myself in this music while painting. This music used to be hard to find and usually only available as expensive imports, but the advent of the internet has made it far easier to find and buy. I was buying some music from a German record seller who also has a record label when he saw the link to the website where my paintings were displayed – he asked me if he could use them on a limited edition series of ‘drone’ music. Drone music is a minimal music genre that uses sustained or repeated sounds, notes, or tone-clusters and can be very immersive and even trance inducing. Front cover by Pete Greening to Drone-Mind – Mind-Drone vol 4. The shapes within the squares change gradually, and the colour outside the squares also changes gradually. This painting is a large one – 48 inches square. By that time I was considering my paintings to be a visual form of drone music – with slowly changing tints and shapes forming the image, so agreed to the use of my paintings – 2 on each LP cover, coming out at roughly yearly intervals. Drone-Mind Mind-Drone’s 5th volume was released a few months ago, and the label owner tells me he wants to do many more. Leslie, to Jean and Pete: How did you first meet as artists, and how did that develop into joint exhibitions? 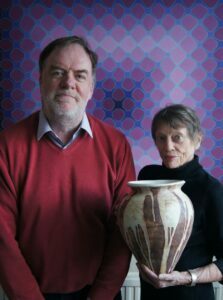 Jean: Pete and I met as artists quite by chance – happening to find ourselves showing our work in the same exhibition. My initial response was surprise as I had not been much interested in abstract art, but I came to appreciate and enjoy Pete’s beautiful canvases and I think it was the same for him with my pots. At any rate our styles seem to set each other off when displayed together. Pete: I had an exhibition at Hemel Hempstead’s Old Town Hall in September 2012. I had hung the pictures on one day and went in to invigilate it / meet my adoring public on the next day and Jean was in there with many pots on display and working away in a corner. She was participating in Open Studios there – I hadn’t been told that this would be happening, (although it was in their leaflet of events I must have assumed that it would be in a different room) so was a bit put out, and this was made even worse by Jean’s first words to me being something like ‘I don’t like abstract art – I don’t understand it’! However, by the end of the exhibition we were firm friends and admirers of each other’s work. Although her pots and my paintings are completely different things, the work of both of us is painstakingly approached and executed and somehow seems to go well together. Plus, when having joint exhibitions we are not competing for space – I get all the walls for my paintings, and Jean gets all of the floor for her plinths and tables! Leslie, to Pete and Jean: Is your art, and art in general, often obsessive in its subject matter and approach? Jean: For a long time past it has been true for me that to feel really myself I need to have at least a couple of pots in the making. If that’s obsessive, then I put my hand up! Pete: Hmmmm – ‘obsessive’ – what a loaded word! I suspect that if you asked my wife, she would say I am obsessed, spending large amounts of time painting to the detriment of, to give just one example, our (small) garden. Indeed, I agree to an extent – if I spend more than a few days without painting I start to get (even more) irritable. Other obsessions when painting are that with only a very few exceptions, my paintings all use tints of colours rather than mixtures (ie colours mixed with different amounts of white paint rather than colours mixed together), and I also now only work in squares. In other ways I am not so obsessive – I’ve already mentioned that while doing a painting I will think of variations on it to paint, but I don’t always follow these through, and although I have tried to make notes / sketches of these ideas, when I go back to them I often don’t understand my notes / sketches so they are lost forever! The most difficult parts of painting for me are the drawing up and the mixing of paints – I mix the colours in advance to ensure even gradations. Once this is done, the actual painting is ‘painting by numbers’ – literally, I number the tints (1 is always the darkest) and then write the numbers in the appropriate part of the paintings before applying the paint. Leslie: Would you like to comment on any of these Jeanette Winterson quotes about art, please? Jeanette Winterson: The true artist is connected. The true artist studies the past, not as a copyist or a pasticheur will study the past, those people are interested only in the final product, the art object, signed sealed and delivered to a public drugged on reproduction. The true artist is interested in the art object as an art process, the thing in being, the being of the thing, the struggle, the excitement, the energy, that have found expression in a particular way. The true artist is after the problem. The false artist wants it solved (by somebody else). If the true artist is connected, then he or she has much to give us because it is connection that we seek. Connection to the past, to one another, to the physical world… A picture, a book, a piece of music, can remind me of feelings, thinkings, I did not even know I had forgot. Pete: The trouble with quotes like this is that it may well apply to some artists but humanity is so varied that trying to pigeonhole sections of it like this just doesn’t work. I am interested in the process behind something that I am interested in (if you understand my meaning!) If something catches my eye / ear then I may well try to find out more about it. Jeanette Winterson: ‘Letting’ art is the paradox of active surrender. I have to work for art if I want art to work on me. Dissolve by Pete Greening. 24 inches square, hung diagonally, so is 34 inches wide by 34 inches high. Pete: When I go to a gallery I will walk through it fairly rapidly, only stopping to look at something that really catches my interest. If I listen to new music, if it doesn’t strike me as interesting first time, I rarely listen to it again. I certainly won’t keep listening in the hope that I eventually ‘get’ it. So I’m not one for trying to understand something that doesn’t interest me, or trying to get something to ‘grow’ on me. The exception to this is books – I don’t read as much as I used to, but if I start a book I will always attempt to finish it even if it doesn’t appeal to me. I can count on the fingers of one hand the number of books I have actually given up reading before finishing. Maybe it’s because to my mind, books require more imagination than paintings or music do, so perhaps giving up on a book is a failure of my imagination rather than a failure of the author? Pete: There is a saying, attributed variously to Picasso, Igor Stravinsky, and Steve Jobs – ‘Good artists copy, great artists steal.’ I’m not sure in this day and age if there is ever anything truly new – we only recycle and renew, and perhaps build on existing things (‘Standing on the shoulders of giants’? Next week, in ROSIE’S SPIRITUAL JOURNEY, I ask Rosie Press who is a school teacher, a Christian, a Reiki Master, a Reflexologist and a Holistic Therapist about learning and healing matters. I think these are pots are quite extraordinary. They are most definitely art of the best kind.